The new school year is around the corner, which means it is time to conduct school bus driver evacuation tests. 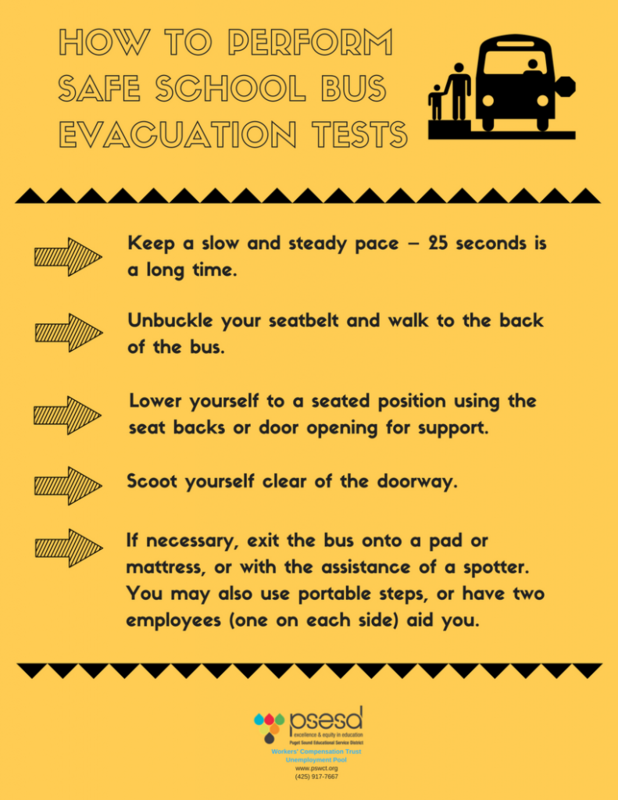 These important tests are required for bus drivers to prove that they have sufficient strength to assist students in evacuating the bus in case of an emergency. During an evacuation test, the driver must be able to move from the seated position in a 65-passenger bus, or the largest bus in the fleet, to the emergency door, open the emergency door, and exit the bus through the emergency door, all within 25 seconds. Please note, there is no requirement to jump out of the bus! In fact, we ask that drivers avoid jumping. Jumping from the threshold of the emergency door of any bus is considered a hazard with a high risk of injury. Over the years we have seen many injuries associated with this test and encourage our district bus drivers to follow the safe method outlined below. The school district may develop and implement an alternative assessment of physical strength and agility. The alternate assessment must be submitted to the school district superintendent for review and approval. Bus drivers play a key role in the well-being of our students. We need our drivers to be safe so that they can keep our children safe. Want more information? Click on the image below to watch a brief video demonstrating how to perform this test safely.